Casper Schnebly vs. Fred. Rohrer Notice delivered to the parties to attend at Casper Snaveley's on the 20th June. Notice delivered the 3rd June 1805. John McCoy, Sr. vs. John Overmyer Notice delivered to J. McCoy the 20th July 1805 to attend at John Overmyer's the 12th August. 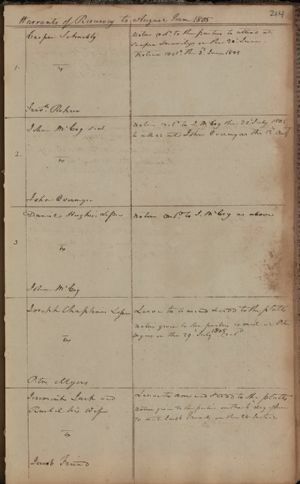 Daniel Hughes's Lessee vs. John McCoy Notice delivered to J. McCoy the 20th July 1805 to attend at John Overmyer's the 12th August. Joseph Chapline's Lessee vs. Peter Myers Leave to amend and add to the platts. Notice given to the parties to meet at Peter Myers on the 29th July 1805. Jeremiah & Rachel Jack vs. Jacob Friend Leave to amend and add to the platts. Notice given to the parties on the 6th day of June to meet Jacob Friend's on the 24th Instant. Rachel Jack is the wife of Jeremiah.